Stuff happens - my amazing life in short stories. A written record for my children. The call everyone dreads. Yes, I was sitting down in my usual spot behind the computer having seen my son and daughter off to school on that fateful date, August 12, 2008. Once the dreadful news had been imparted my friend, the messenger of same, waited for a response from me. All I could say was,"I don't know what to do!". Luckily for me, my friend did and had already co-ordinated airline tickets for me and the kids to fly home to Alotau. Phone back on the hook, I tried to pull myself together and think of the next move. Should I call the school and inform the children at once or leave them to enjoy their day blissfully unaware? I called another close friend to ask her opinion and we decided on the former. The two teenagers were back home in no time. "What's up?" they inquired looking suitably worried. News off my chest, we all broke down and wailed loudly for a while. Fast forward to Alotau. This is a third world country and funerals are a do it yourself affair. No funeral homes here to ease your way in this time of pain. The local Constabulary insisted on a Post Mortem because he had been found dead on our lounge room floor and other people had been visiting the house. This was a major delay since the hospital was short of doctors qualified to do the job. The wet season was in full swing, dropping torrents of rain 24/7 ever since our plane touched down at Gurney. Not conducive to digging graves, never the less, relatives held a meeting and diggers were appointed to the task. In between times, I went shopping for a coffin, clothes, soap, towels, and other items needed to clean and dress the body which we had to do ourselves as well. 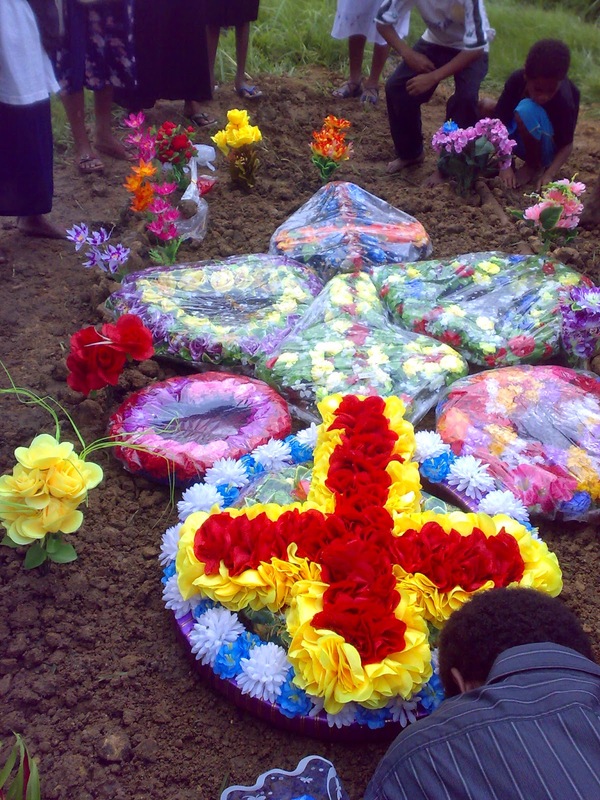 I also argued vehemently with relatives who wanted to ship him back to the outer islands for burial. I negotiated with the local Catholic Church for a place to bury him because the Kwato cemetery he had requested in the event he should go before me, had been closed by the Health Department. The worst part was being required to attend the morgue with my daughter to formally identify the body. There he was, presented on a cold stainless steel table without a stitch of covering. Expressionless, his skin felt cold and his curly hair looked like grass with a layer of frost. Our daughter collapsed in a heap so I had to stay strong and comfort her. I was then asked to be present for the Post Mortem but opted to wait outside. I felt sick when, much later, the sound of a saw could be heard through the thin fibro walls of the operating theatre. In tears, all I could think was how horrified he would be if he could know what they were doing to his body. He always did hate hospitals as it was. It was the third week after his death that we managed to put him to rest. The service was held in the United Church and our youngest daughter was strong enough to sing for her Dad whom she loved so much. Everyone present broke down listening to her voice - not a dry eye in the church. We emerged from the United Church, loaded the coffin onto the truck for it's final journey to the graveyard. It had actually stopped raining and a pale sun shone through the clouds. For this final part of the funeral, we were accompanied by the local Catholic Father who administered the last rites. He held my hand tightly as the soil was back loaded on top of the coffin. I felt reassured and calm for the moment.. I then observed some relatives approach the grave wailing loudly and calling my late husband's name. Anger welled and I wondered how they had the cheek to be so up front when they never did visit him in life and hadn't contributed a thing towards his funeral either! I was so close to telling them to f*ck off that I beat a hasty retreat to my ute which was the signal for everyone else to leave. My final weeks in Alotau were spent clearing the house of our personal and household belongings for distribution amongst those relatives who had helped and supported me through this difficult time. I returned to Cairns two months later owning the sum of what was inside my one suitcase. Learn to speak Thai before you go. Find out how here !